[Episcopal News Service] New Hampshire Bishop Robert Hirschfeld has rowed on the Connecticut River for years. It once was a sort of industrial “sewer” but has since been cleaned up and restored to “a place of stunning beauty,” he said. Hirschfeld intends to show it also can be a place of worship and an inspiration for prayer. This sounds like an amazing journey of peace. So true, that not every pilgramage must wind up in Israel. There’s beuaty right here. There’s peace right here. What a wonderful time to commune with God and spend time in prayer at the end of a tiring day of paddling. I’d like to sign up next year, at least for a day paddle. Thank you Faith. I’ll check out the prayer book. Blessings to everyone on the pilgrimage this year. Reading about your Connecticut River pilgrimage makes my heart glow. It is such a wonderful idea. I wish all participants a safe and inspiring journey. I can’t wait until the paddlers arrive here in Norwich VT and Hanover NH! We are so looking forward to the celebration! A wonderful dream has materialized! I’ve enjoyed Connecticut River vistas many times, especially from the bridges in Glastonbury, Falls River, and Haddam (by Goodspeed opera and airport). Not infrequently, as a wetlands consultant, I have the good fortune to land a job by the river, hunting for a rare river birch, micro-anlyzing an eroding shoreline, permitting a dock, and utility right-of-way work. As a CT Botanical Society (CBS) volunteer, I’ve compiled a species list in a silver maple forest for the 3-River Bioblitz in East Haven and led CBS field trips in the Wagunk floodplain meadows in Portland. These riverside habitats are amazing wild places, a treat to botanize in, at their best in early summer. 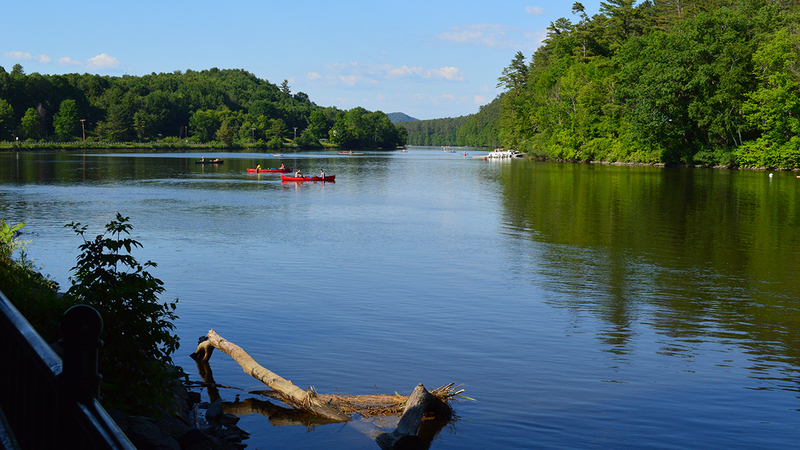 Only once have I canoed the Connecticut River, as part of an impromptu reconnaissance trip in East Haddam, where the pristine Salmon River joins the mainstem, a little flotilla of canoes on a gorgeous day, led by Casper Ultee and Penni Sharp. Like the initiator of this 40-day Episcopal river trip, I have daydreamed about a canoe trip all the way down the CT River, with my extended family. Thank you all for your prayers and blessings — and for your enthusiasm! We look forward to seeing you as we paddle downstream, and would love to hear from anyone who has an interest in doing this again, either here or in another place.